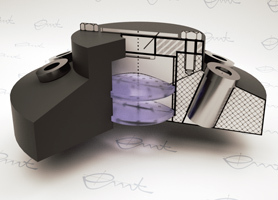 The techniques developed and used by the Measurement Engineering Group are often used for process measurement. One core aspect is ultrasonic measurement, which is used for flow measurement or liquid analysis. The acoustic emission analysis extends the examined frequency bandwidth into the area of audible acoustics. Above that, optical components are used for other processes, i.e. NIR moisture measurement and colorimetry and colour density measurement. This page shows a few selected examples from the areas of process measurement and sensor systems. More examples can be found in the other categories on our webpage, i.e. level sensors, selective audio emission or determination of material properties. The ultrasonic flow measurement is a contactless, precise and maintenance-free method and has developed to the growth driver in the area of flow measurement. The measuring principle is based on a time of flight measurement in flow direction and in the opposite flow direction. If the sound propagation and the liquid flow points in the same direction, the measured time of flight increases, whereas if the flow and sound propagation is antiparallel the time of flight decreases. Using the difference of both measurands the average flow velocity is calculated. The need for still more precise, more efficient and also cheaper flow meters or sensors increases steadily. 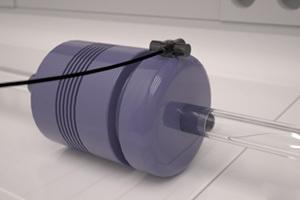 Particularly ultrasound flow sensors offer a great innovation potential for example for the exact dosage of smallest amounts of substances, for the simultaneous identification of the liquids (for instance to avoid misfuellings) as well as for the simultaneous density measurement or mass flow measurement and many more applications. When a liquid contains gas bubbles, resulting dispersion and absorption have a strong influence on the measurement. The researcher’s objective is to develop a new kind of impulse based ultrasound measurement system, which can continuously measure the substance's properties (sound velocity, acoustic impedance, acoustic absorption, …) and at the same time characterizes the gas phase. It is possible to directly measure the size of the gas' bubbles and their volume. The knowledge of a material’s moisture content is very important when working or storing free flowing and solid goods (grain, pre-packed food, sand, paper etc.). There are different physical principles which can be used in the measuring process, which all have their individual pros and cons. For a contactless and permanent measurement the infrared reflection method is the best solution. The Measurement Engineering Group, together with REMBE GmbH from Brilon, Germany, has developed the measurement system NIROMM™ (Near Infrared Reflexion On-line Moisture Measurement), which's core is new detector head. Acoustic pressure, produced by a sound source, is measured with a calibrated microphone. DIN 45635 describes the positioning of microphones and the procedure for computing the emitted sound pressure level. 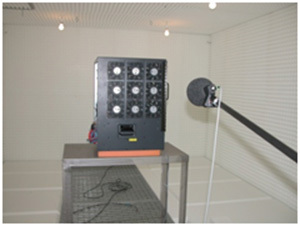 The measurement is done in an anechoic room, which is available at the Measurement Engineering Group. The calculation method complies with DIN45631 (Zwicker) and gives for example knowledge on the noise pollution in working environments. An extra third-spectrum shows the dominant frequencies and a spectral analysis give hints to the direct causes of sound generation in order to find suitable concepts for sound reduction. The emission of structure-borne sound is frequently caused by vibrations in a technical device. 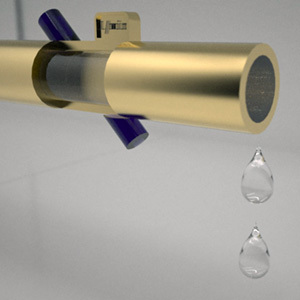 These vibrations produce sound which spreads across solids (pipes, fittings, walls) or across liquids in the pipe as well as airborne sound (noise). Depending on spectral composition and sound pressure level of the emission of structure-borne sound the health or the well-being of persons as well as the functionality and the reliability of technical devices is influenced negatively. It is well known, strong acoustic emissions are a clear indicator for wear or a defect at the device. A detailed analysis of the structure-borne sound by means of accelerometer and standard microphones can help to investigate the causes in detail. If the vibrations caused by constructional faults the effective procedures for the diminution of the unwanted acoustic emission can defined immediately. These sensors can be also integrated into a technical system (pumps, drives ...) if a high reliability of the system is demanded. It is important to select proper types of vibration sensors and to find a suitable place. One aspect for judging prints is the optical density, being the visual optical density for greyscale prints and the optical density for each colour channel (CMYK, optical density status E) for colour prints. 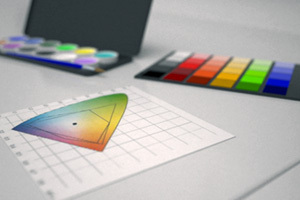 The determination of colour-values is either done with the three-spectrum-measuring method or the spectral method with standard light. To not influence the measuring process thermally and energetically, multiplexed LEDs with different spectrums can replace halogen lamps. This way the primary valencies of all three colour channels can be recreated, just as required by DIN and CIE. The control of the measuring process, handling, supervision and visualisation of the results in the different colour spaces can effectively be done with the help of a microcontroller.